Food Costs > How Much Does an Avocado Cost? How Much Does an Avocado Cost? The avocado, also known as the alligator pear because of its shape and green, rough exterior, is grown in the United States, primarily in Florida, with California coming in a distant second. While there are more than 80 varieties of avocados, the Haas variety is the most common choice. At a local grocery store, an avocado can usually retail for $1 to $2.50 each. The price will usually depend on the time of the season and where you purchase it. Walmart, for example, sells a five pack of Del Monte Avocados for $4. The Hass Avocado Board tracks the prices of avocados, and at the time of this writing, prices were about $1.25 per avocado. In 2017, Money Magazine noted the prices for avocados doubled due to the heatwave affecting California and the demand has surged. The prices, which used to be about $1 for a single avocado, raised close to $2 each. The Florida avocado, when compared to the Hass variety, commonly grown in California and seen in a local grocery store, will be larger, smoother in texture and will contain less fat. The Hass variety, for example, contains 4.6 grams of fat per two tablespoons, whereas a Florida variety contains three grams, with more than half of the fat in each being the healthy monounsaturated fat. For this reason, shoppers may often see the term “lite” avocado when shopping, but all this means is that the fat content is lower. Aside from the fat content being slightly different, a Florida avocado has fewer calories, about 36 calories per two tablespoons, compared to 50 calories seen in the Hass variety. Otherwise, aside from the fat and calorie difference, the nutritional value remains the same. The last difference, and most possibly the biggest difference, is the taste. The California avocados often have a richer and creamier taste, making it a better option for a guacamole dip or even toast. For salads, however, the slices of a Florida avocado is often considered due to its ability to hold its shape well. In a single raw avocado, it can contain around 300 calories, four grams of protein, 17 grams of carbohydrates, 13 grams of fiber and 29 grams of total fat. It also has a high content of folic acid, potassium, vitamin B6, vitamin C and vitamin E. Avocados also contain copper, magnesium, manganese, niacin, riboflavin and phosphorus. Choose an avocado that is slightly soft to the touch, heavy for its size, and do not have dark, dimpled spots. They must also be free from bruises. When picking one out, slightly squeeze with the palm of your hand; if it yields to gentle pressure, it’s ready to eat. If not, it will be ripe within the next few days. If you purchase an unripe avocado, store it in a brown paper bag at room temperature. It will ripen in two to three days. A Hass avocado will turn black when ripe, but a lot of the Florida and non-Hass varieties will remain green. Avocado can be used in place of butter in many recipes. You can slice the avocado vertically and twist to break it in two. Remove the pit, then you can scoop out the flesh. 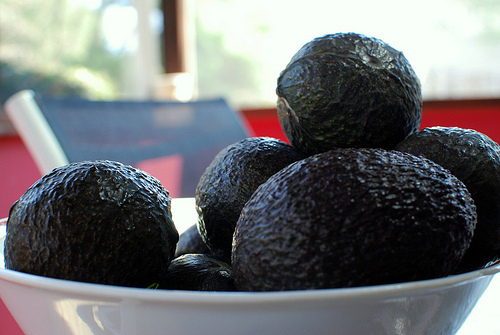 There are a lot of varieties of avocado, but the dark-green pebbly-skinned avocado, known as the Haas avocado, is the most common type in the United States. Avocados can turn bitter when heated, so they are usually eaten raw. To avoid the avocado’s flesh from darkening, rub the avocado slices with lime or lemon juice. This is also true with avocado that has already been sliced; splash some lemon juice on it to keep it from getting brown. Ripe avocados are generally going to be free of bruises and dark spots. The size may range from small to big, depending on your preference. Unripe avocados are often hard to the touch. Avocados provide many nutrients that are believed to help prevent Alzheimer’s disease and can keep your brain healthy and function properly. Avocados can help keep your triglycerides and blood pressure low to promote a healthy heart. Eating avocados while you are pregnant can help the fetus properly develop the brain and other vital organs. It can also help to reduce the risk of stroke. Your eyes can stay healthy by eating avocados. The avocado is a great food for people suffering from diabetes since it helps lower blood sugar levels. Avocados can aid in digestion and can also help your body recycle and replenish antioxidants in your body, keeping you feeling and looking younger for longer. It has been shown that avocados may help prevent prostrate and breast cancer. You can buy unripe avocados in bulk to save more. Just remember to store them properly for them to last. Most grocery stores and sellers will often hold sales during the peak season. When in season, consider stocking up.